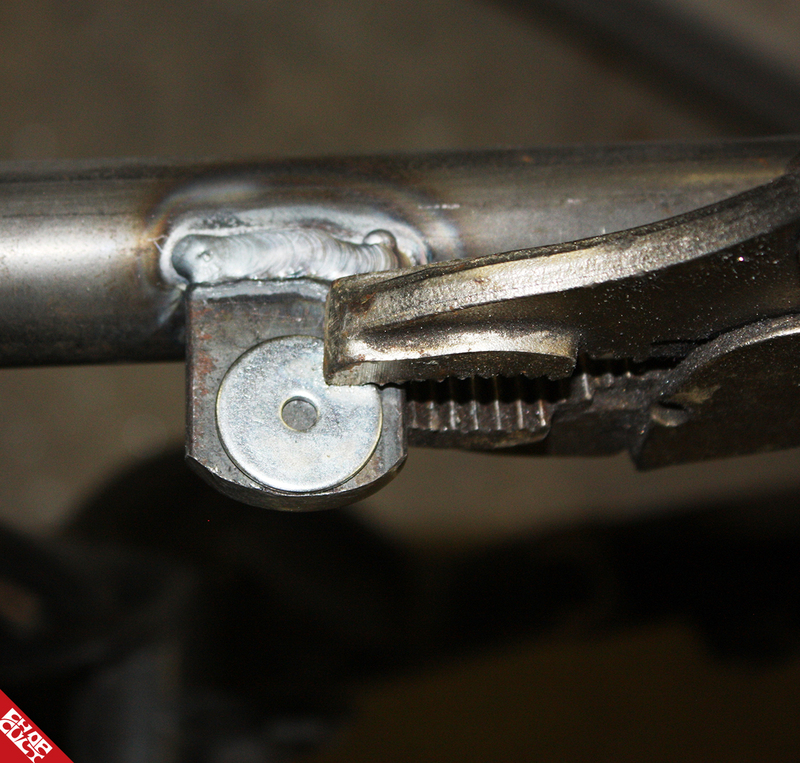 This is an easy way to make your own mounting tabs and weld them on your frame. 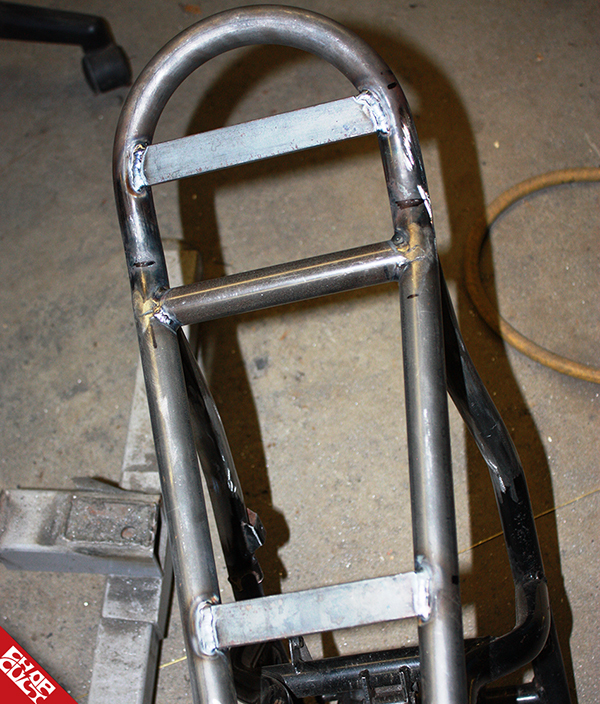 In this scenario I needed 4 tabs to mount a seat pan on a RD350 Tracker/Motard frame. 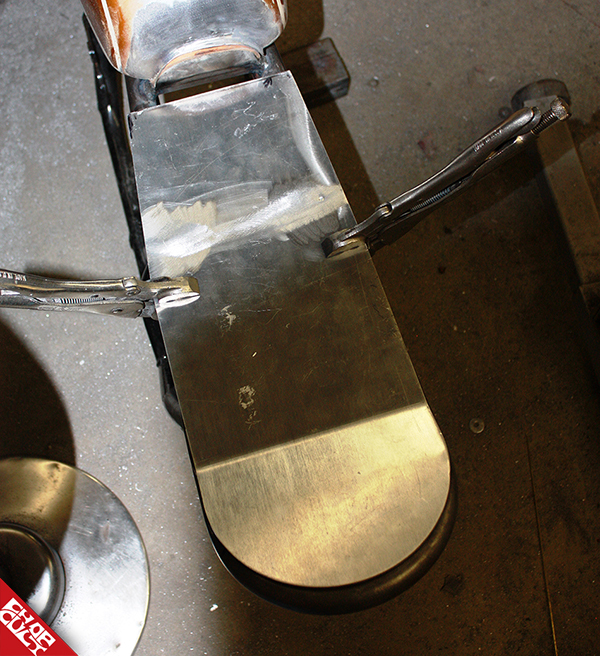 In most cases, it is not just making the tabs, but also ensuring they are welded exactly where they are needed. That means that they should be aligned straight across from each other! 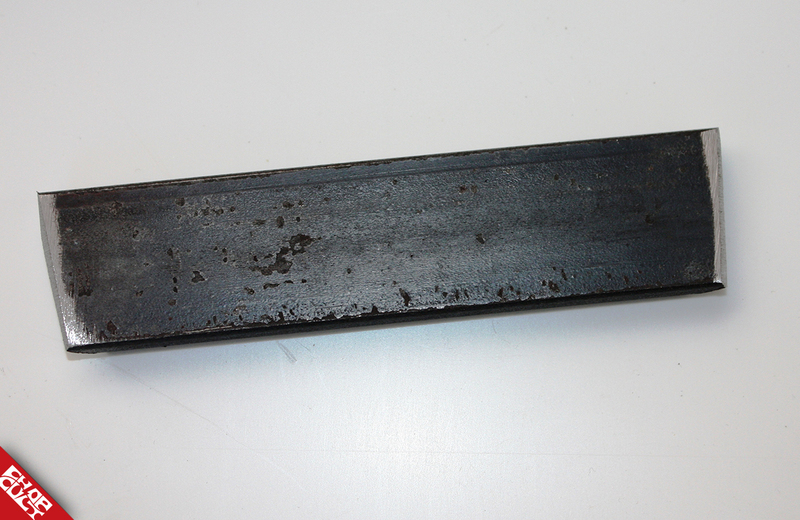 Instead of making 4 separate tabs I simply start with 2 pieces of ¼” x 1” flat steel stock. 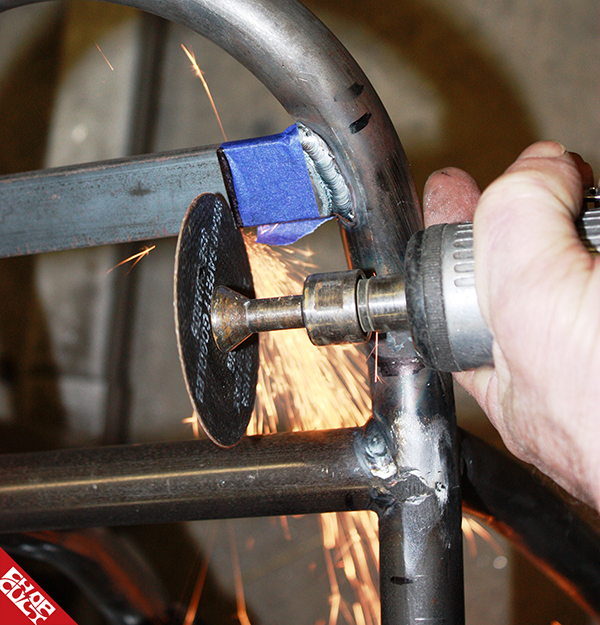 Grind the ends to a taper to allow them to sit evenly with top of the frame tubing. 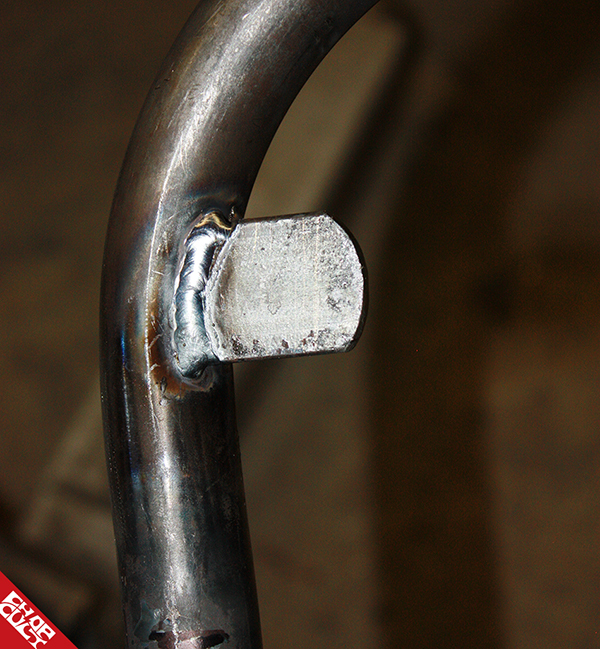 Weld the flat stock on the frame in your desired location. 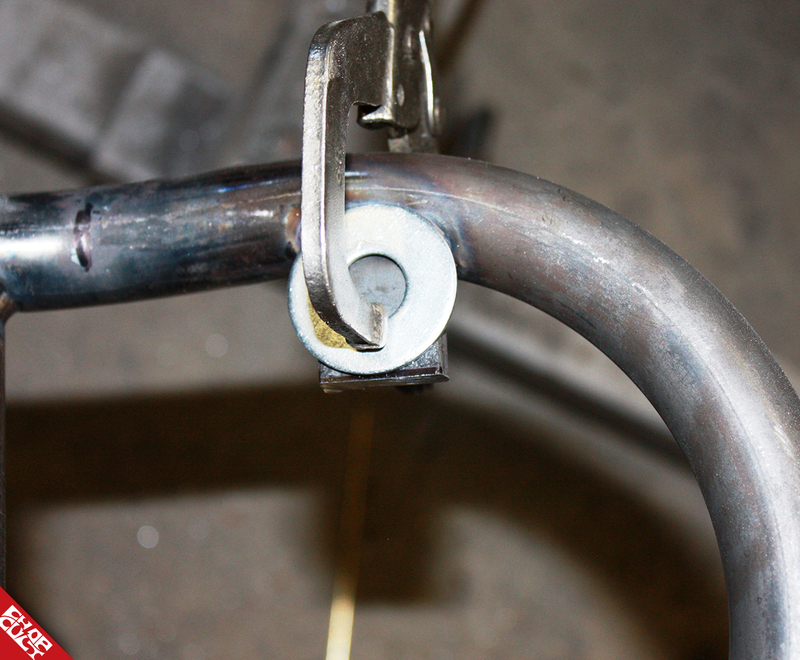 Be sure that the top of the flat stock is even with the top of the frame tubing. Instead of measuring, just use 1” wide masking tape. Use a sharpie, mark it also for an extra guide for the cut. 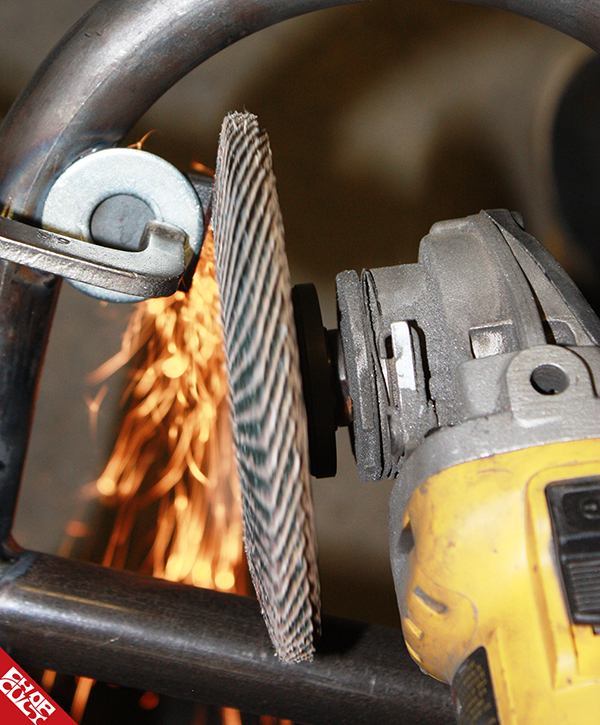 Using a cut-off wheel , cut on the end of the masking tape. Choose a washer that has the radius you want your tab end to look like. I like the look of a bigger radius. Then clamping this washer onto the flat stock gives you an easy-to-see guide. 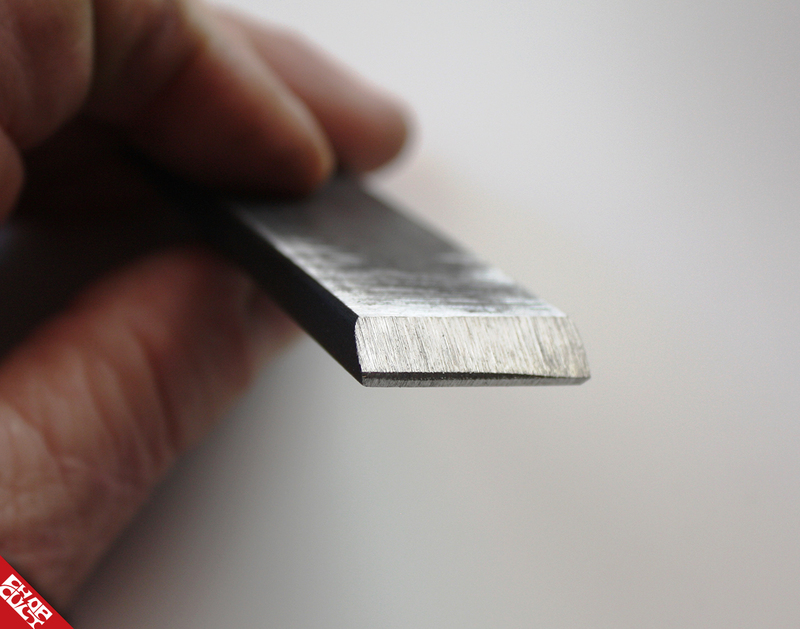 It’s easiest to grind the radius with a flap disc on a side grinder. The washer makes it much easier to see how much to grind off to get the proper radius. The radius is now done. 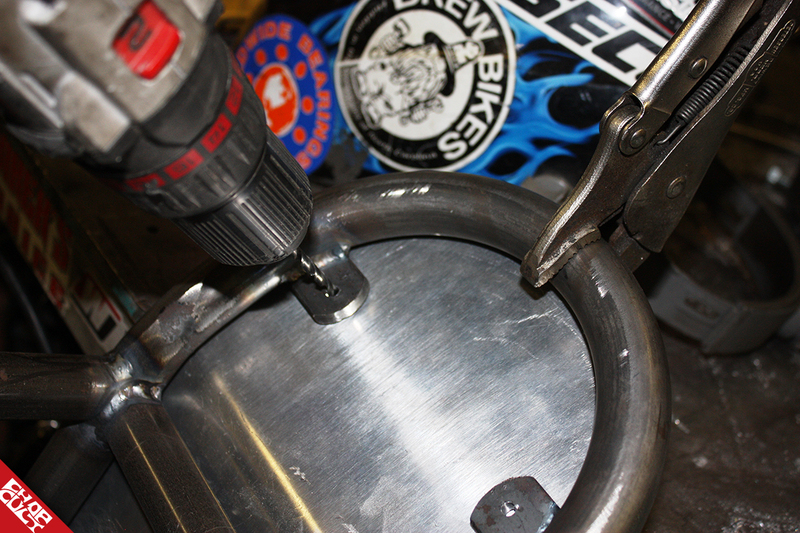 The hole placement in the tab is easily located using a smaller fender washer and clamping the washer in place. 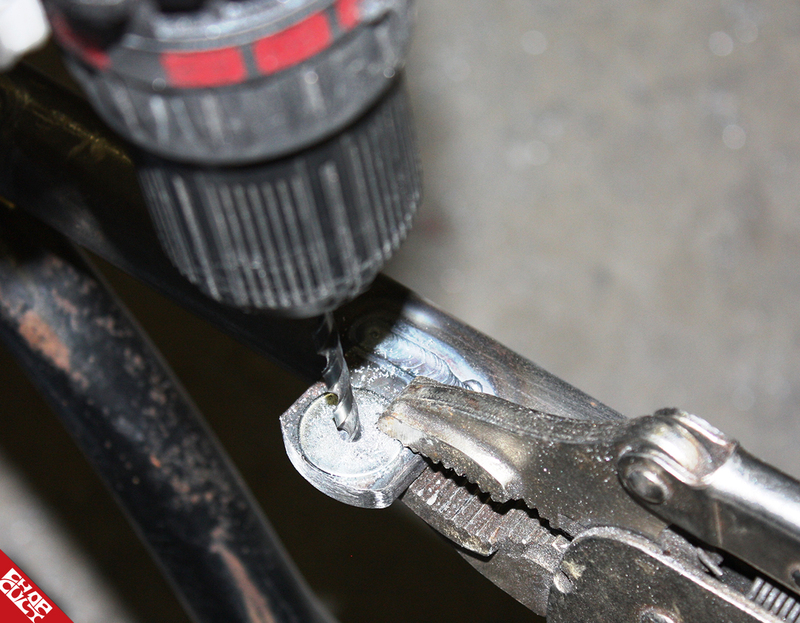 Place the seat pan on the frame and secure its location with a couple of clamping pliers. Drill from the bottom side with the pilot drill bit. 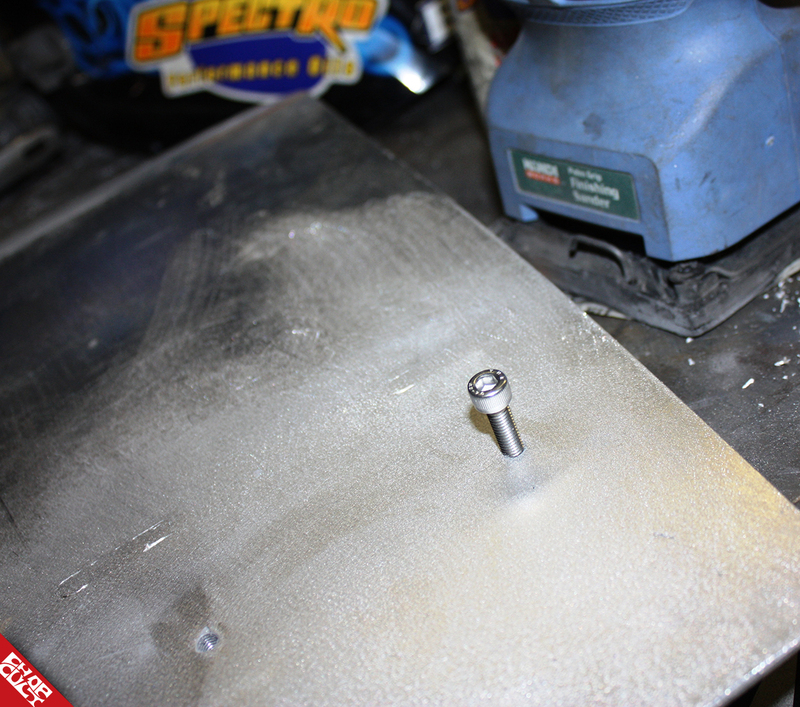 In some cases you can’t get a drill in this location, so in this case mark where the hole needs to be drilled. On this seat pan I chose to have the mount holes to be threaded. 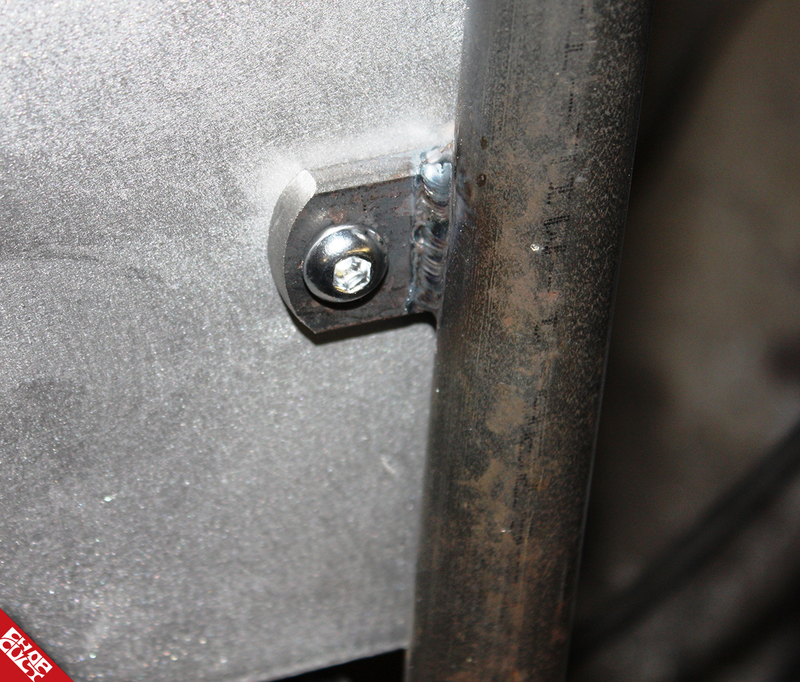 For a little more thickness to allow for more bolt threads, I simply welded on some aluminum pieces, then drilling them from the pilot hole locations on the other side of the pan. Drill to proper size for the tap thread size. Be sure while tapping these threads that the tap is straight. 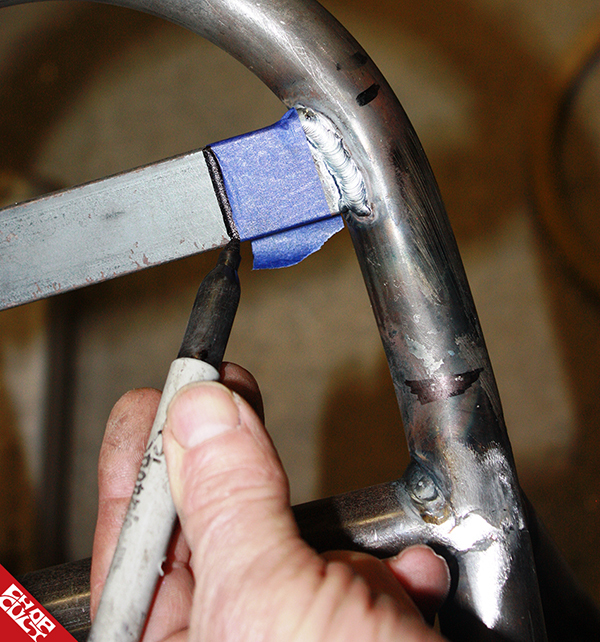 The tab holes on the frame were drilled to allow the bolt to freely pass through. Thread in your bolts and now the pan is firmly held in place. Take your time and you will end up with some tabs that look BETTER than most factory frames have! 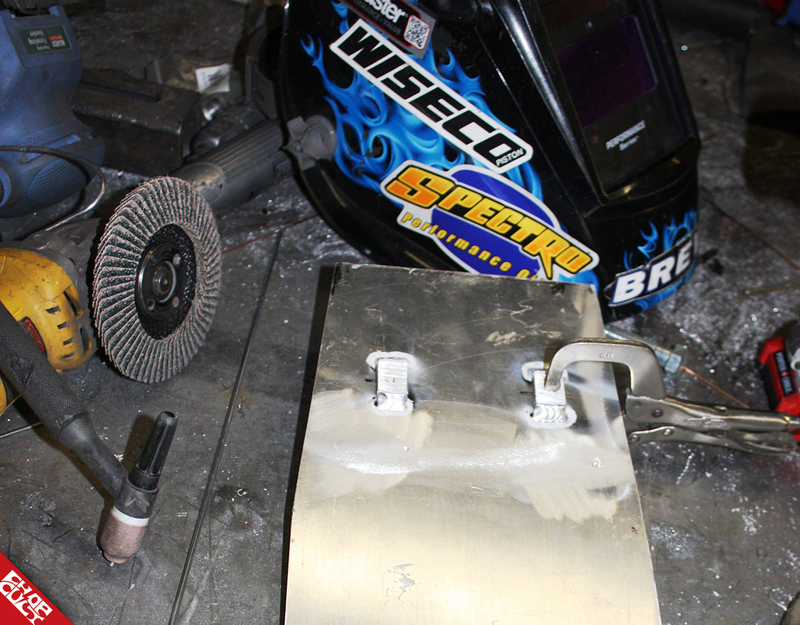 Cut, Weld, Drill, and Grind! Cool tip thanks for the write up! Always good stuff from the Brewdude! This is perfect. I will be starting a project this will help with! that's too simple, great wise-dumb! Nice tip. Easy straight forward idea.